The weld toe is a primary source of fatigue cracking because of the severity of the stress concentration it produces. Weld toe improvement can increase the fatigue strength of new structures significantly. It can also be used to repair or upgrade existing structures. However, in practice there have been wide variations in the actual improvements in fatigue strength achieved. Based on an extensive testing programme organised by the IIW, this report reviews the main methods for weld toe improvement to increase fatigue strength: burr grinding, TIG dressing and hammer and needle peening. The report provides specifications for the practical use of each method, including equipment, weld preparation and operation. It also offers guidance on inspection, quality control and training as well as assessments of fatigue strength and thickness effects possible with each technique. 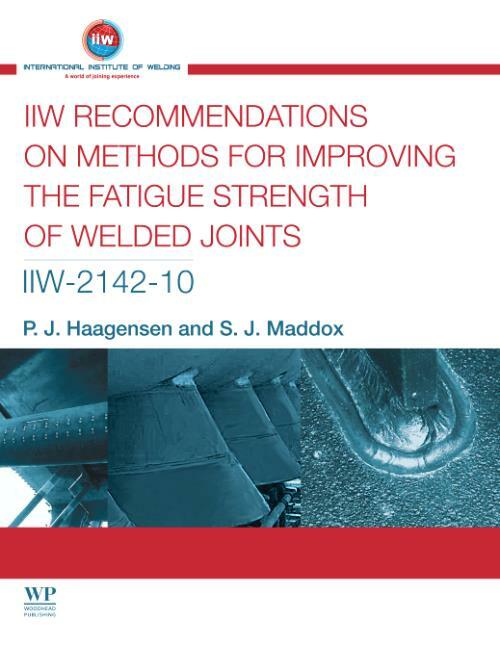 IIW recommendations on methods for improving the fatigue strength of welded joints will allow a more consistent use of these methods and more predictable increases in fatigue strength. Scope; Burr grinding; Tungsten inert gas (TIG) dressing; Hammer peening; Needle peening; Recommendations related to structural hot-spot stress; References. Haagensen, P JPer J. Haagensen is Professor Emeritus in the Department of Structural Engineering at the Norwegian University of Science and Technology (NTNU) and a Consultant. Maddox, S JStephen J. Maddox is a Consultant with The Welding Institute (TWI) in the UK and is also Visiting Professor in the Department of Mechanical Engineering at the University of Strathclyde, UK.